Delivery without recommended bulb 1 x 230W Qt de12 halogen lamp. 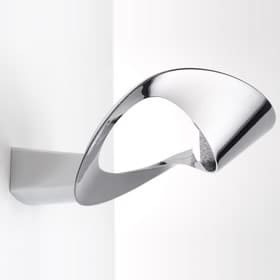 The sinuous curved line of this lighting conceals the light source inside it, allowing - almost as if by magic - a soft bundle of light to cast its rays upward. Lamp body available in enameled or chromed die-cast aluminum. Indirect light. Colours: white, silver or matte or glossy chrome. Do you have a question about "Mesmeri Halo"? How can we contact you?